A New DANGANRONPA Anime Has Been Green-Lit! A new anime in the Danganronpa series has been green-lit. 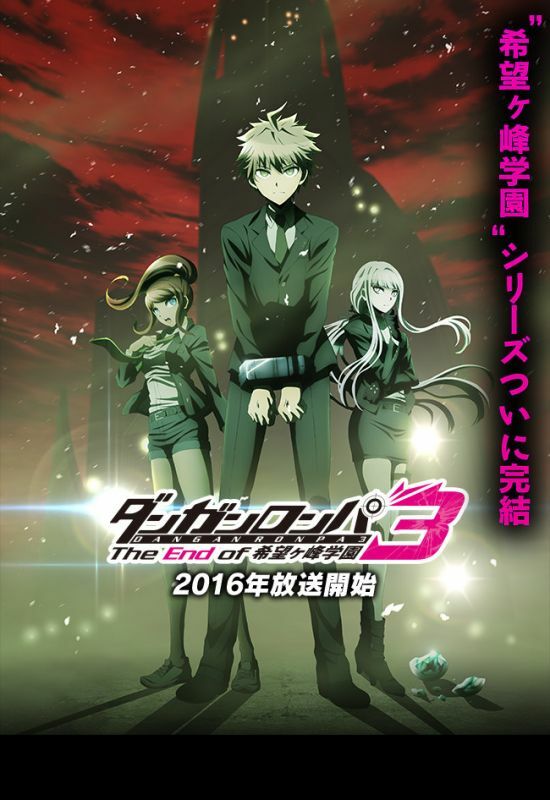 It’s title is Danganronpa 3: The End of Kibougamine Gakusen (Danganronpa 3: The End of Hope’s Peak Academy). Despite it having the number 3 in its title, this is the second entry into the Danganronpa anime series and is slated to wrap up the Hope’s Peak Academy original story. The anime is set to air in 2016, but it is unknown as to which season it will air in at this time. The original anime aired in 2013 and has since been licensed by FUNimation for North American distribution. The anime is based off of a series of video games for the PSP and PS Vita handheld systems. Both games in the series ( Danganronpa : Trigger Happy Havoc and Danganronpa 2: Goodbye Despair) are available in the U.S. through NIS America. Spike Chunsoft, the original creators of the game, announced New Danganronpa V3: Minna no Koroshiai Shin Gakki for Playstation 4 and PS Vita and will release the game in 2016.